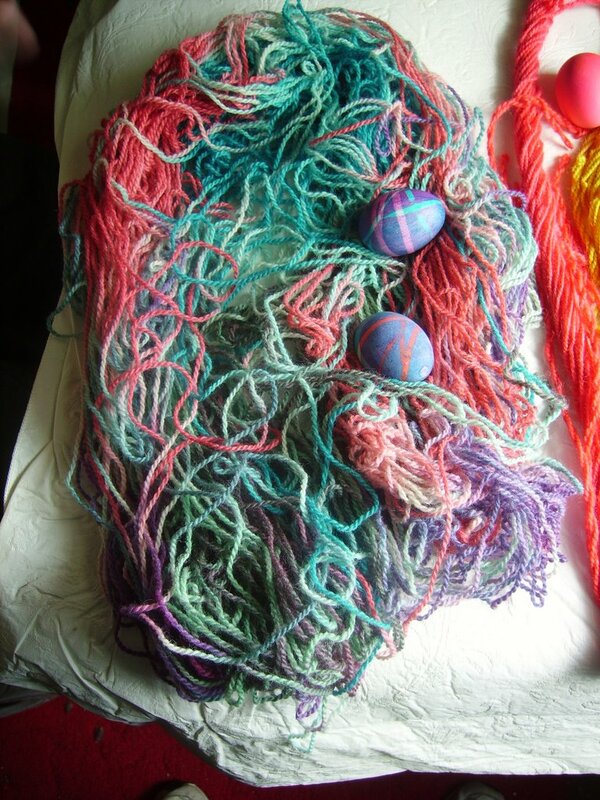 Sit back, take a load off, and enjoy my pictures and comments about my latest looming projects. Maybe I'll even throw in some needle knitted goodies! Or get really crazy with some crocheting! Why on earth haven't I posted since April? I haven't been doing much looming lately, which is also one reason why I haven't posted in such a long time. I've attempted a few things with needles and for the most part, they've turned out alright. I'm not completely happy with them, but I never am happy with my own creations. 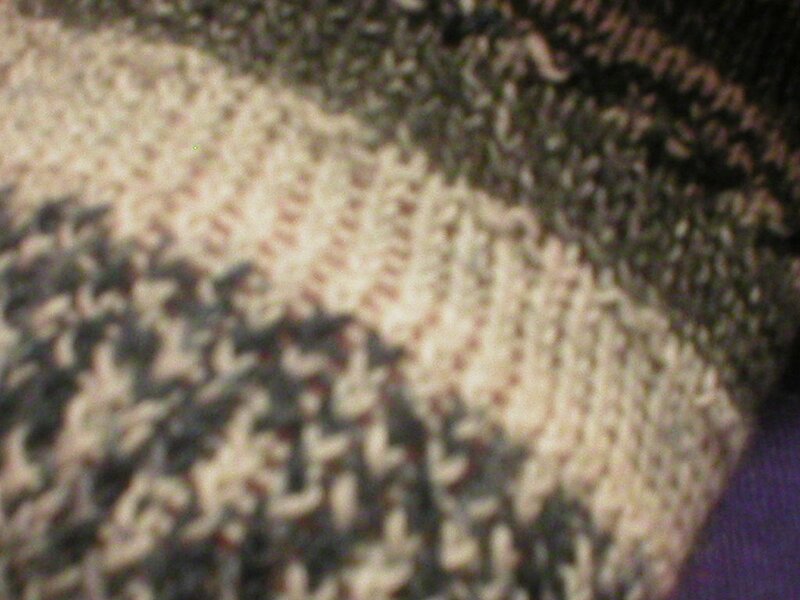 They consist of an "under mitten" which is a fingerless mitten including the thumb. The "over mitten" is basically a short mitten, including thumb, that goes, amazingly enough, over the under mitten. I'm not happy with the instructions though. The right and left over mitten were listed separately, then another section for instructions that work for both mittens. 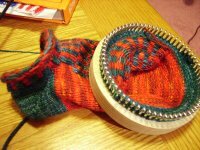 The combined instructions include buttonholes to attach the over mitten to the under. It should be rather straight forward, but the buttonholes come out in a totally different place than in the picture. Now I'm confused (as you should be too). 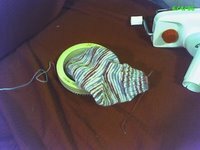 Was I supposed to work the specific section of the right (or left) mitten and then work the instructions for the buttonhole? Or was I supposed to work the specific instructions, jump over to the combined instructions, then come back to the specific instructions. Now I'm REALLY confused. As you should be too! I'm quite pleased with the way this purse turned out! I started out by using the Travel Hat loom from Decor Accents. After a few rows, I felt was much too tight. It was almost as if it had already been felted. What fun is that?? Then I switched over to the DA AJAL and it went much faster and much smoother. I cast on only on one side of the board, doing the basic knit stitch for roughly 2-3 inches. 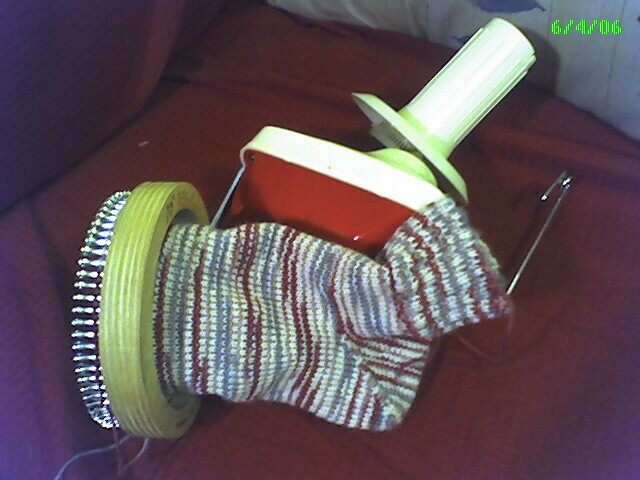 I pulled the fabric over to the other side of the loom, putting the cast on stitches on the opposite pegs. 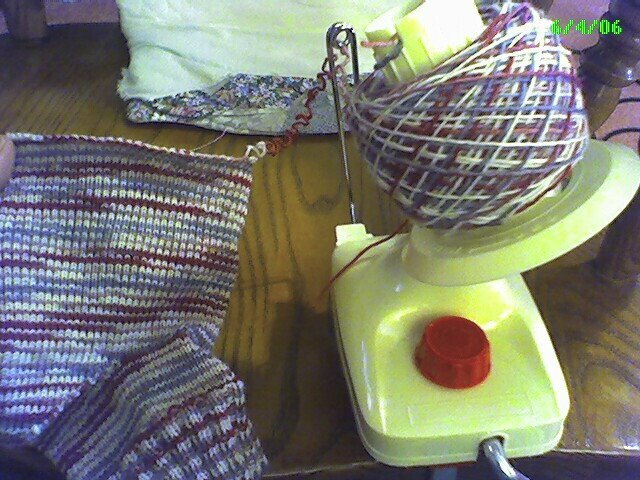 When I realized I was getting close to the end of the ball of yarn, I did a simple bind off along the two small edges and one long edge of the loom. 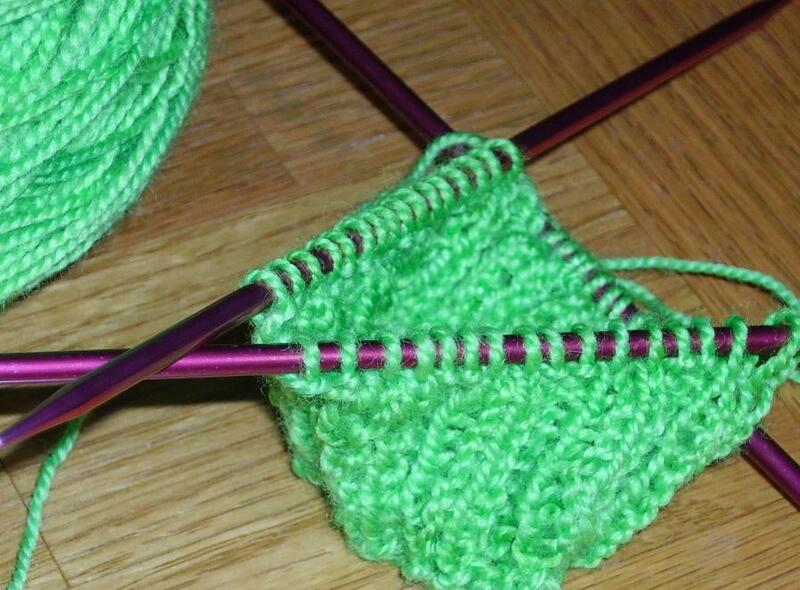 On the fourth side, I knit back and forth until I simply ran out of yarn. 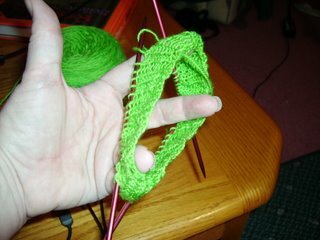 It was a bit tight to try and take one loop and put it onto the next peg and knit off, so I pulled a few stitches off at a time onto a crochet hook I had sitting around. Taking two stitches off at a time, I did a simple cast off with another crochet hook. And TA-DA! The finished product! Before felting, the measurements were 11 1/2" x 6 3/4". After felting it measured 9 x 5 or so. I'm planning on heading up to JoAnne's later this week to find some purse handles or something. I need to have something to carry it on my shoulder as I usually carry my wallet in my back pocket! If I don't see anything I like, I'll just HAVE to knit up an i-cord or something and felt it! As I said in my earlier post, I used McCormicks food coloring and vinegar. When I felted the purse, I put it into my front load washer with a pair of jeans and hot water. I didn't let it go a full cycle at first. I didn't think the water was hot enough so I threw it into a load of darks and went through the entire cycle. I still didn't care for the look of it and put it in with a full load of whites. The colors seemed to dull just a little, but I'm not sure if it was because I used a pair of dark jeans or that's just the nature of the beast with the colors fading a little. Either way, I've very pleased with my "Popsicle" purse. I do think my mom is right though: she said if I'd started the purse at the bottom with the blue, the colors would have turned the purse into a tropical feel with the ocean and a sunset/sunrise. How cool is that? 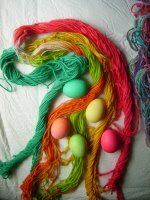 The Easter Bunny helped me dye yarn! 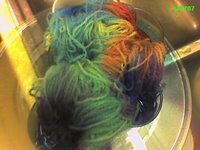 I have yarn. I have vinegar. I have food coloring. Would it work? I honestly didn't think it would. 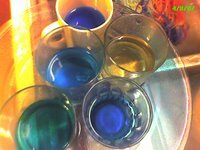 I'd read tutorials about Kool Aid dying, acid dying, etc., but I'd never heard of using plain ol' food coloring. I'm sure there's something about it out there in cyberland, but so far, I've missed it. So here's how I did it. 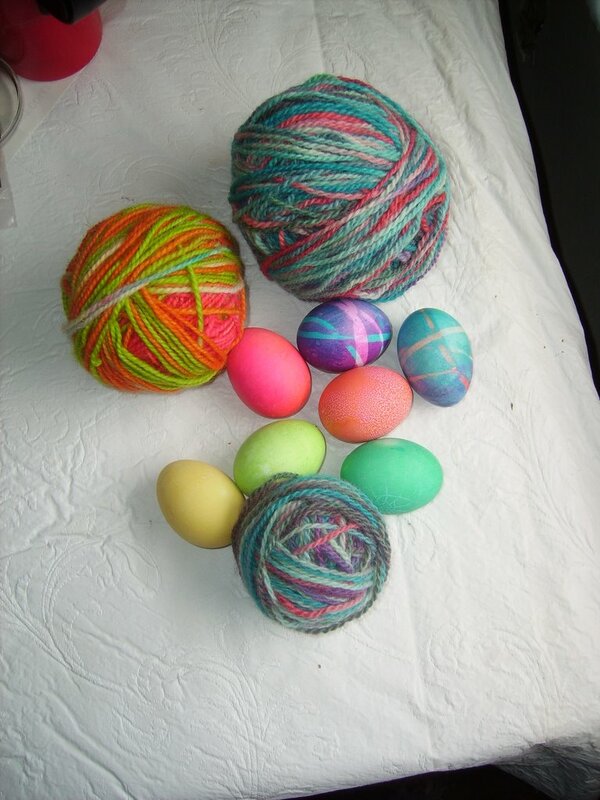 First, while dying eggs, I'd taken two hanks of 100% wool yarn apart and put them in a pot with cool water. I understand this helps the wool absorb the dyes better. Like a damp sponge absorbs better than a dry one. Second, I hollered at my son just in time to keep him from mixing all the dyes together! I always liked doing that too! 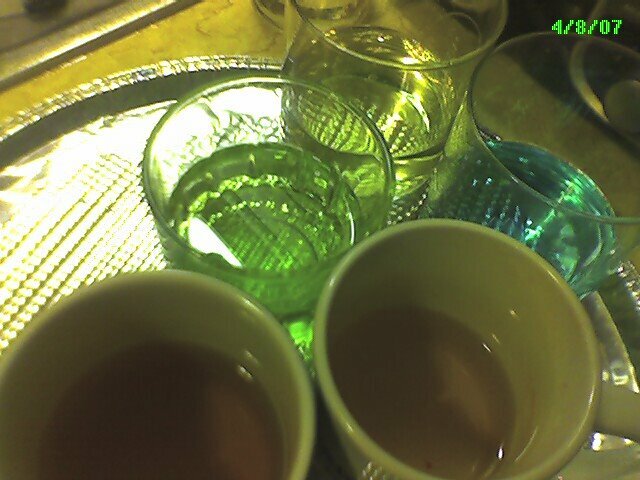 I'd already put a teaspoon of vinegar in each of the glass cups as per the instructions on the box of food coloring. When the eggs were taken out, I added more vinegar (although I didn't measure exactly) and I added a bit more boiling water to each cup. One set of cups had McCormicks "Neon" food colors and one set was the standard four colors of blue, green, red and yellow. I separated the hank, with no rhyme or reason, and stuck a section of it in each cup (5 different colors). Then, I put the cups, water and yarn goodness in the microwave and zapped it for two minutes. I let it rest for awhile, although there was no set time. BZZZZZ - zapped again for another two minutes. SNORE - letting it rest for awhile. I may have zapped it again, but I really don't remember now! I finally let it cool off totally. 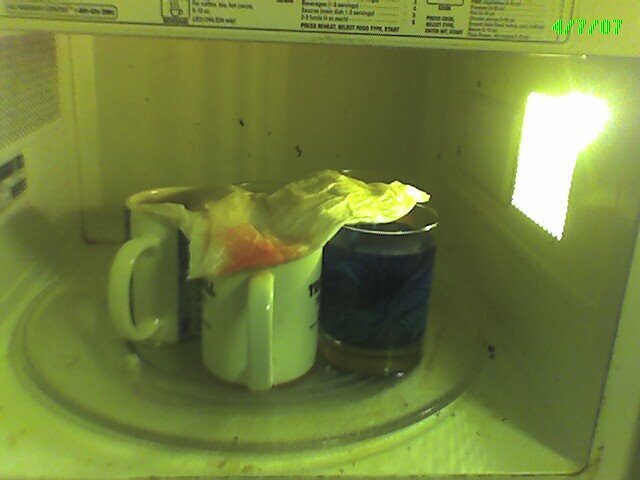 The wet paper towels on top of the cups were to keep the exposed yarn wet. 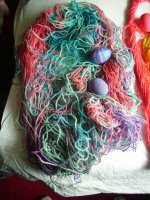 I was afraid the yarn would dry out and burn up! That would just be my luck! 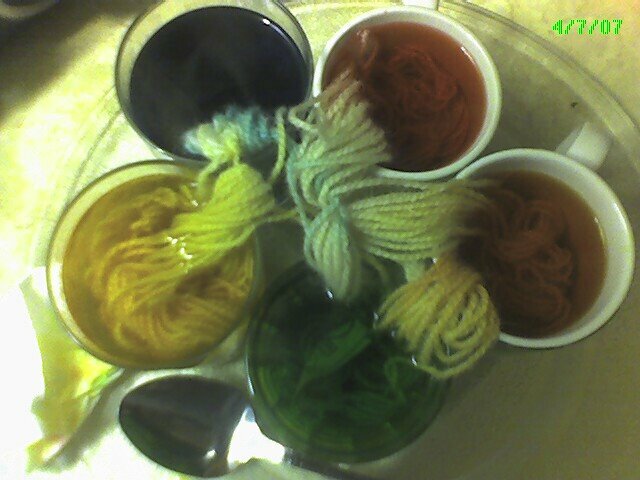 As you can see, much of the dye was soaked into the yarn and the cups are relatively clear. Cool, huh? Now, here are the results. Are they not the neatest thing?!!!? My mom calls the color on the left, "Tranquility". But the color on the right, which I think is perfect, in my humble opinion, is popsicle". It really fits! I rinsed the hanks and very little dye bled out. I was actually surprised. To test it further, I wrapped the hanks in a white dishtowel and wrung some of the extra water out of it. Not a single spot! 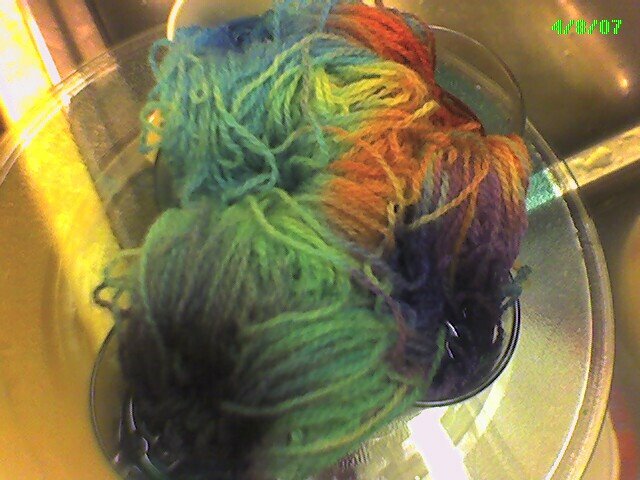 I'm not sure what I'm going to make with this yarn, but I'm sure in won't be anything to wear. The wool is just too scratchy. A new felted purse perhaps? Time sure does fly when you're crafting doesn't it? I'll make this quick as I have dinner to get on the table! I haven't done a lot of looming lately, but I've been busy, busy, busy doing some cross stitch work for my pen pal. Brenda and I have been pen pals for pushing 30 years (say it ain't so!!) and she had her first baby last year!!!! 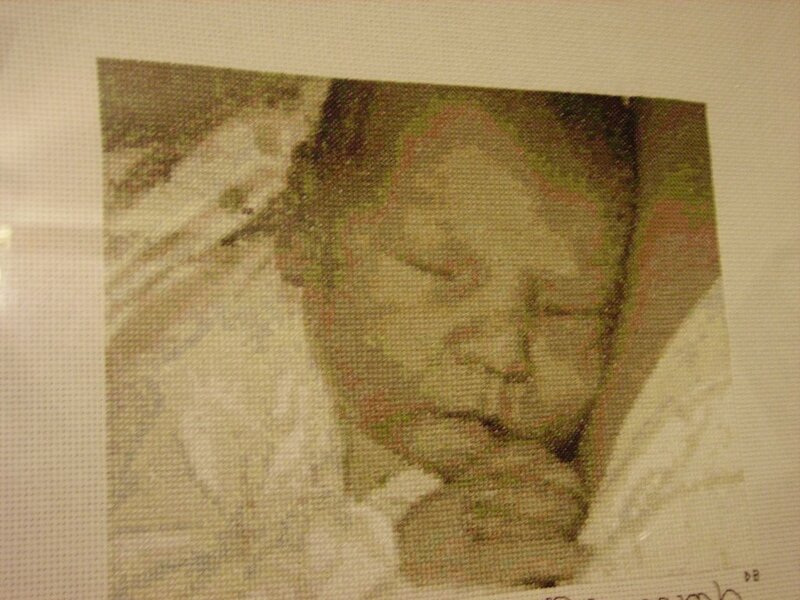 She sent out the pics of the cutey pie, Anthony, and I cross stitched the picture. I used PC Stitch, but didn't care for the colors it was coming up with, so changed the coloring to sepia. I must admit, I think it turned out rather well, don't you? 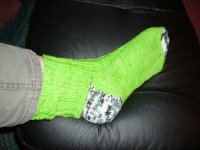 I also want to show you my first attempt of needle knitting socks. The jury is still out on that one. It's not too hard to "ignore" the other needles that aren't being used, but it's not too easy either. Know what I mean? Naturally, since I'm my own worst critic (aren't we all? ), I don't care for these socks. Of course I made lots of mistakes, but I'm not too concerned about that. I used too large needles for one thing. I used size 4, although the instructions called for 3s. This made it much stretchier than I wanted. I suppose I should just shut the heck up about it, but it's hard, ya know?? So, since my mom has circulations problems and can't wear tight cuffed socks, guess who's getting these!! 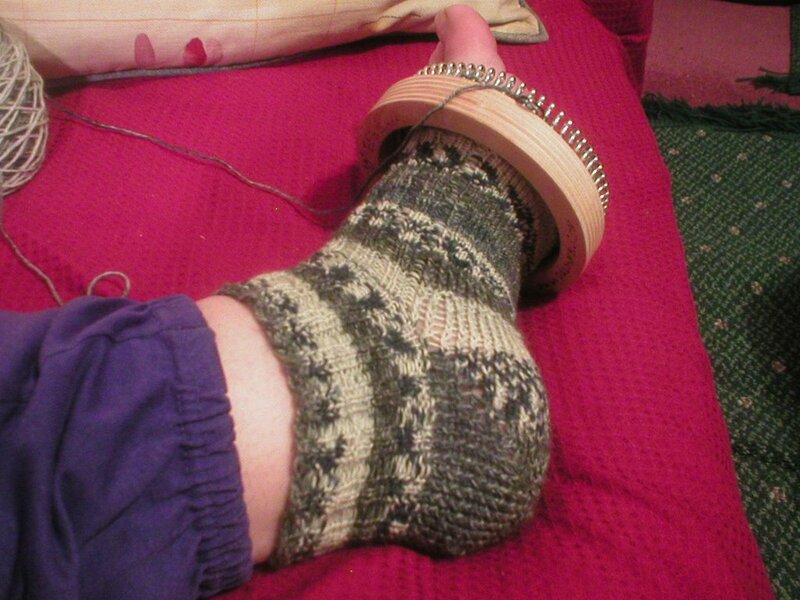 But, since this is a looming blog, I have to add my loomed sock! I'm not quite sure how long I've had it on the loom, but let's just say, it's been a long, long time! I At least I'm getting close to having the toe finished! Just for giggles, I think I'm going to needle knit the matching sock to this loomed one. Then I can do my own side by side comparison! 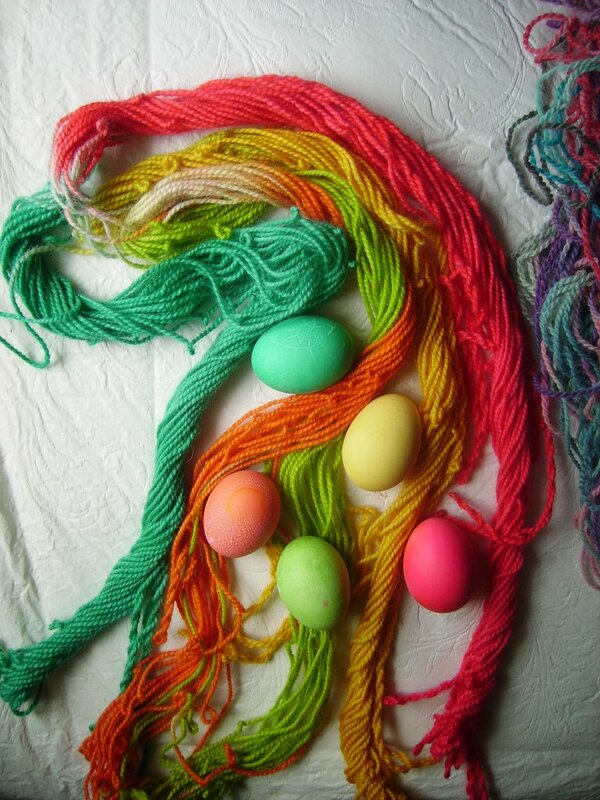 Happy Looming Everyone! 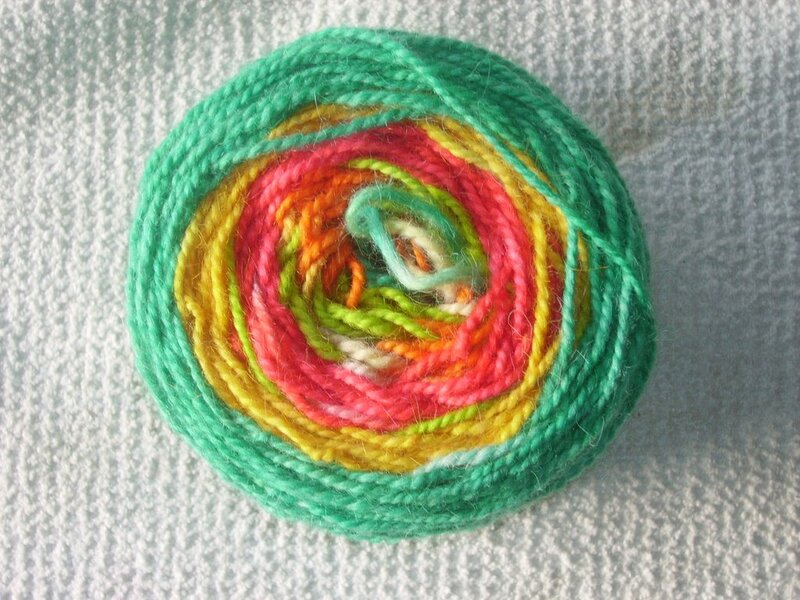 I bought some sock yarn on eBay with the hopes of making a lot of socks. The yarn I bought was in shades of grays and white, so I used this color first since I didn't particular care for it. If I messed up, I wasn't out much. I used the e-wrap (twisted knit? Is that what it's called now?) on a 10" Extra Fine Gauge sock loom from Decor Accents. Wonderful piece of "machinery", let me tell you! You can see the twisted part of the heel, but then I changed to the stockinette stitch (flat stitch) because it was just plain easier and faster. It was much too loose for my liking. It took me forever to finish the socks and although I like them, they don't jump out at me because of the color. So my mom is getting them! She has trouble with most socks being too tight around her ankles, so these will be perfect for her to wear at night when her little (very little, actually) piggies get cold. 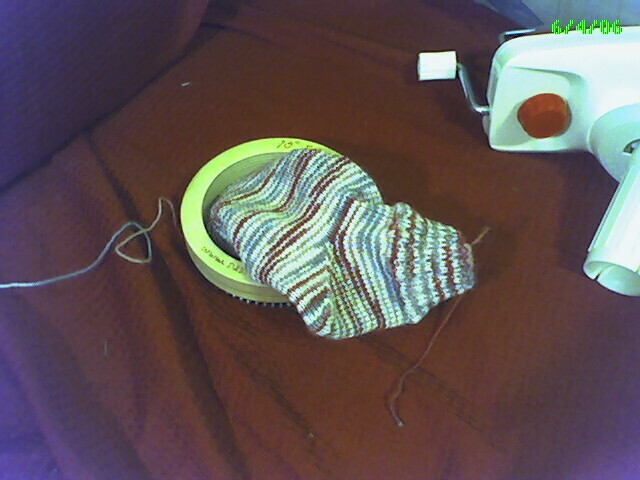 Then I started another sock with Lorna's Laces in Parfait. 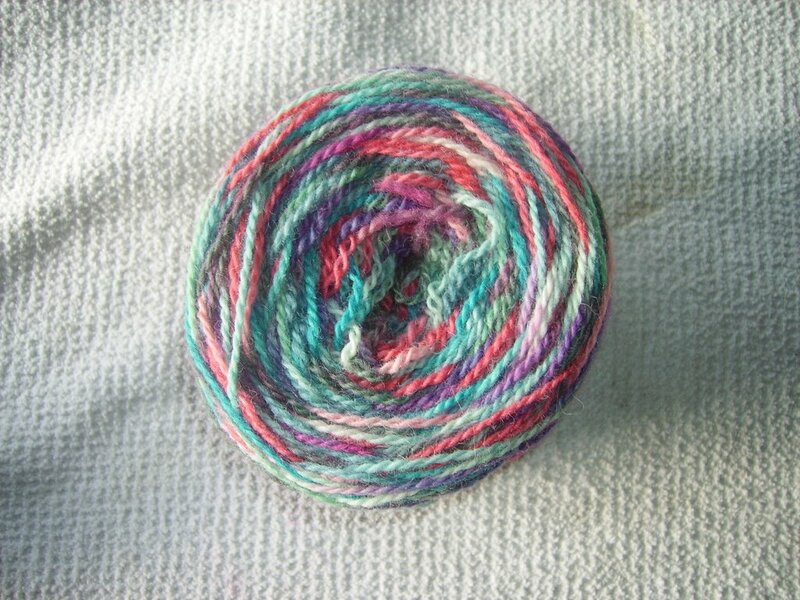 I absolutely love this yarn, but I have to brag about the lady on eBay I bought it from. Her name is Linda Gorman and she trades under the name "emtnestr" on eBay. I know there are other sellers out there that do a wonderful job, but I doubt very seriously I'll do much more hunting around. She is positively the best person I've bought yarn from yet. I've purchased a lot (and I do mean a LOT) of yarn from her and the most I've ever paid for shipping is a little over $10.00. And that was for several POUNDS of Cherry Tree Hill Supersock Mill Ends. Yes, I said POUNDS. 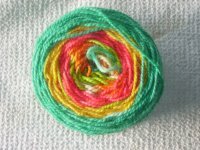 I adore my LYS, Never Enough Yarn in Winchester, VA, but Pam is almost 20 miles from me. The drive alone would cost that much in gas. It's nice to know if I pay early on a Friday, I'll have my goodies on Monday (now emtnestr is in Vermont and I'm in VA, so Your Mileage May Vary!) She packages everything in zip-lock type bags and she's wonderful to deal with (did I tell you that already?) 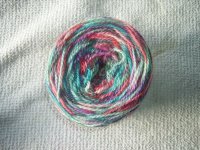 So, if you see "Blank243" bidding on some yarn, you know I'm out for a good deal!